allows the author to hold the copyright without restrictions. DOAJ is a white list of open access journals and aims to be the starting point for all information searches for quality, peer reviewed open access material. 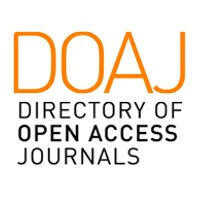 DOAJ is often cited as a source of quality, open access journals in research and scholarly publishing circles. A DOAJ Membership is a clear statement of intent and proves a commitment to quality, peer-reviewed open access. DOAJ is co-author to the Principles of Transparency and Best Practice in Scholarly Publishing (Principles) and DOAJ members are expected to follow these principles as a condition of membership.